7 comments to Heart Valves, Digital Levels and Happy Holidays. I hope all goes well with your daughter, Rob. A Mitral Valve replacement is a major procedure but is done fairly commonly so the experience level of most centers is pretty high. I will keep her, you and your family in my prayers. Please convey my wishes to your family for a safe and wonderful Holiday Season. Hope all goes well with the operation. As to the countertops, don’t over think it. It’s at the joint you need the best accuracy, and even that isn’t as critical as you might think. Laminate covered particle board will soon conform to the underlayment. In fact, you might want to lay boards all along the front and back edges to prevent sagging between the boards that are perpendicular to the walls. Unless you plan to change things, I would bolt a 2×4 (stood on edge) to the front & back frames at the top of all the bases, tying them together. That gives a good edge to set the counter on. You gave me a lot of good advice Roger. 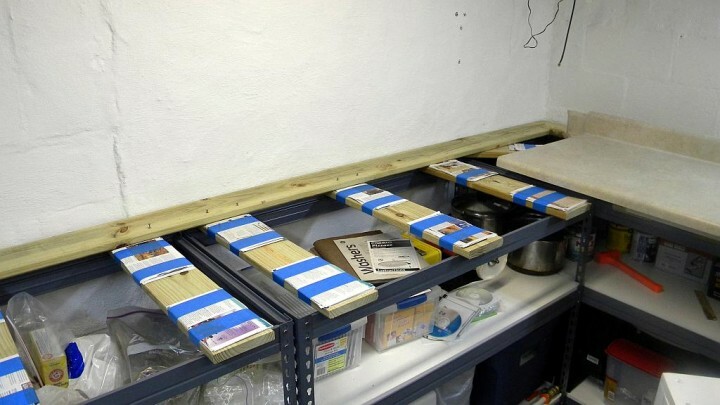 Lengthwise supports would provide much better support, especially along the front edge of the countertop, and it would be much easier to get them level. However, my desire to push the countertops forward about 4-inches may not make it possible to bolt the 2x4s to the metal frame. So I’m more inclined to put them on top of the existing boards. But I want to lay the 2x4s flat instead of on edge so the workbench isn’t too high. And since I’m going to have to go to the store anyways I may use 2x6s. What do you think? BTW, this wasn’t the way I was going to build this workbench. My original plan was to weld up a frame using 2-inch square steel tubing. I thought it would be stronger, quicker to build and more portable if we move. It also wouldn’t have cost much more than wood construction. But I picked up these shelving units somewhat impulsively at the only Black Friday sale I’ve ever gone to. Then I realized I couldn’t use them where I was going to. So I’m using them for my new workbench instead. Unfortunately the “wood” shelves they came with quickly sagged even with almost nothing on them. And a scary looking greenish-gray mold quickly started growing on them. So I spent about $100 to replace them with 3/4-inch melamine covered particle board I bought at Home Depot. I could have some saved money by using plain particle board but they look good and will be easy to keep clean. So far I’ve spent $100 for the original units, $100 for replacement shelves, $208 for two 10-foot long laminated countertops and at least another on $30 on boards, clamp kit, shims, screws and other materials. If I’d realized at the start that I was going to spend $450+ I would have probably explored cheaper options. On the other hand I’m going to have a workshop that looks nice and that’s kind of important to me. One of my life-long goals has been to have a nice well-equipped workshop and achieving that goal has become more important as I’ve grow older. I’ll also have lots of useful shelves which I probably wouldn’t have if I’d gone cheap. And I’ll be able to take this workbench with me without too much trouble if we ever move or I decide to rent a space for a bigger workshop. Best wishes on the heart surgery. Jan 8 will be the 4 year anniversary of my mitral valve replacement. I opted for the organic (porcine)type because the metallic ones require ongoing use of a blood thinner, which is a big hazard to a machinist. I figure when it needs replacement that the materials and techniques will be vastly superior to those currently in use. As Mikey noted, it is a serious operation, but not uncommon. I felt much better after the surgery, so will your stepdaughter. She came home today and quite frankly looks like crap. But I’m sure you’re right and she’ll feel much better once she’s fully recovered. She seemed to be very tired over the last year or so but I assumed it because she’s a single mom with two young kids. Now my wife and I realize it was probably because of her heart. So, updates? How’s the daughter doing? Where are the pics of the completed benches? You can’t leave us hanging like this! She’s getting better. It’s been a little less than 3 weeks since her heart surgery and she’s still tired and weak. Although, I think pain and the side effects of her pain medication might be limiting her just as much or more. There were some noticeable improvements right after the surgery. For example, her fingers looked healthy and pink again instead of gray. I took your advice and screwed 2x4s to the front top rails of the shelving units. They made them more rigid and provided a good level reference point. I couldn’t mount 2x4s on the back rail so I set a bunch of them flat where the top shelves went and then used shims to level up the back edge of the countertops. I can finally switch to working in my new workshop instead of on it. But I’m not going to post any pictures until I have something more impressive to show. I still need to put up peg board, install some new outlets on the wall and bring a lot more tools in from my garage. I also need to build a temporary stand for my CNC mini-mill. It’s going to stay in it’s wooden cabinet until I can build a new metal and Plexiglas cabinet that can handle coolant. Many of those chores are going to have to wait because I want to get back to working on my CNC router.